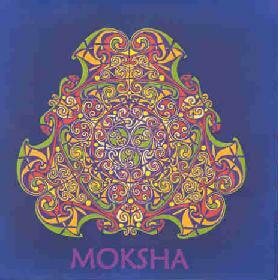 Moksha was the name of a project of Seaweed (current Ozric Tentacles synthesizer madman). They recorded 100 minutes of ambient freeform floating space compositions. They were mostly all recorded live to tape, with no overdubs. Seaweed plays the Korg Poly 800, Roland JX8P, Korg MS20, EMS Synthi AKS and Roland TR707. Quiller plays the Roland D50 and Roland SH101. Quite a lot of classic synths used. The 707 drum machine is only used on a few tracks. This is not as polished as the Nodens Ictus project, which was occurring around the same time but that was not all recorded live to tape, as I am aware, like this is. The initial CD-R pressing of 100 is now sold out as I am aware but I had heard another pressing was to be made, so some of you out there might have a chance to hear it. Contact Quiller for more information at: mokshamusic@hotmail.com.